When consent has been given for the Educational Psychologist to be involved with a person, information in relation to the person will be collected, held and used by the Educational Psychologist. Information in relation to the person might include their: name; address; date of birth; assessment findings; health, medical and care details; views; and family background. Some of the information gathered may be: sensitive information e.g. safeguarding information; and ‘personal data’ i.e. data relating to a person that can be used to identify a person. As well as collecting information about the person for whom consent has been received, personal information about other people may also be gathered, for example their family members. This information will only be gathered and used where the Educational Psychologist deems it relevant to the persons circumstances, the circumstances for which Educational Psychology involvement has been requested. Information in relation to the person will be collected by the Educational Psychologist directly from the person or indirectly from other sources, such as parent/carer or other professionals involved with the person. Information in relation to the person will be collected and used to inform the Educational Psychologists understanding of the persons needs, and so that the psychologist can provide relevant and informed advice to you and to other adults working with the person. The Educational Psychologist will not use the data for any other purpose. The Educational Psychologist will only become involved with a child when signed consent for their involvement is received from the child’s parent or other adult with parental responsibility. The Educational Psychologist will share some or all of the processed information with the person for whom consent for Educational Psychology involvement was received (depending on age and ability), and the organisation/person that requested Educational Psychology involvement. The Educational Psychologist will not share the data with other parties without the consent of the parent/carers, apart from within exceptional circumstances where the law allows the Psychologist to do so. Exceptional circumstances in which data may be shared with other agencies without consent from the parent/carer include circumstances where there is immediate risk of substantial harm to self or others; or under a legal requirement, e.g. terrorism, drug money laundering; or via court order for disclosure. We share information so that your child’s needs can be understood and addressed. Information in relation to the person, collected by the Educational Psychologist, will be held in paper and electronic format. Paper formatted information will be locked away in a lockable cupboard/filing cabinet. Electronically formatted information will be stored on a password protected: ‘electronic cloud’; laptop; and/or tablet. Information in relation to the person will be held, as a minimum, for as long as is reasonably needed for the purposes explained in this notice (above). It may also be necessary for information to be kept after the piece of work with the person has ended, for example to ensure that an accurate record is available in the event of any challenges or further involvement. The information will be held for a maximum of 25 years. The persons data will be destroyed by deleting the electronically stored data and shredding the paper stored data. 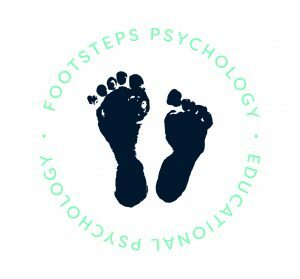 If you have a concern or complaint about the way your personal data is collected or used you should raise your concern with the Educational Psychologist at Footsteps Psychology in the first instance.